Aboard were Russian Anton Shkaplerov, American Scott Tingle and Japan's Norishige Kanai, ending a 168-day mission. The capsule landed at 6:39pm local time on Sunday without apparent problems, descending under a red-and-white parachute. 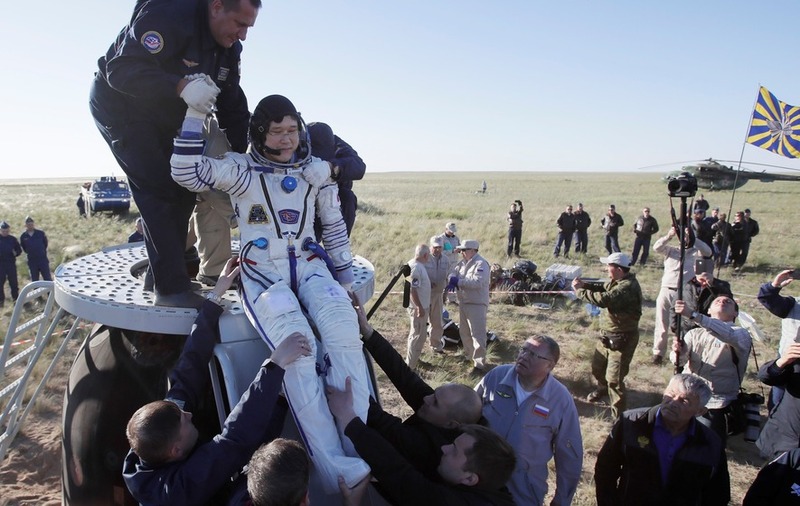 On board were Russian Anton Shkaplerov, American Scott Tingle and Japan’s Norishige Kanai, ending a 168-day mission. The orbiting laboratory now has a crew of three – Americans Drew Feustel and Ricky Arnold and Russian Oleg Artemyev. Another three astronauts are to be launched to the station on Wednesday.